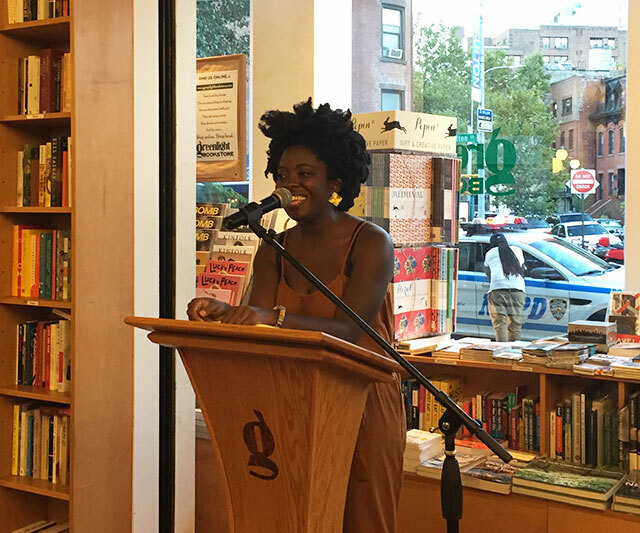 Yaa Gyasi read from her debut novel Homegoing and took questions from the audience at Greenlight Bookstore last week. She was introduced by Imbolo Mbue, author of Behold the Dreamers. Much of the novel focuses on love stories. Writing a multigenerational book meant love stories had a natural place in the novel since love stories produced babies and ultimately later generations. However, as the narrative progressed, Gyasi realized there were many different iterations of love, not only romantic love. Different kinds of love ultimately serves to hold the family together. It also opened up the discussion of ideas of what is love and how a family is defined. When it came to research for the book, Gyasi looked over many sources but never dug too deep into any single one. “I read a little bit of a lot of books,” she said. The choice was deliberate because she didn’t want the novel to feel too stiff with research. The novel began with Gyasi taking a trip to Ghana. Before the trip, she had planned on writing a novel about a mother and daughter. A friend came to visit, and on a whim they visited the Cape Coast Castle, a fortress used during the slave trade. That triggered a new concept for what she wanted to write and from there she began working on Homegoing. She then spent seven years working on the novel. The hardest chapter to write was the third. She wanted to set the book in England where people from the United States were sent for education, but research for what life was like during these educational trips was too scarce. Once Gyasi figured out the structure of the novel, the book began to come together. She says she wanted to track how racism and slavery had subtle changes over time, and that meant several generations of people. She wasn’t entirely sure the whole thing would work out until she was finished.